Let's dance in Bali. Tari Jauk is a sacred dance in paradise. Bali as a world tourist destination does offer many attractions such as art, culture, food, fashion, yoga, music, and the things you dream about. You can make Bali as a place to calm yourself, enjoy the beauty of nature. You can also choose the Island of the Gods as a place to enjoy the beauty of art and culture. 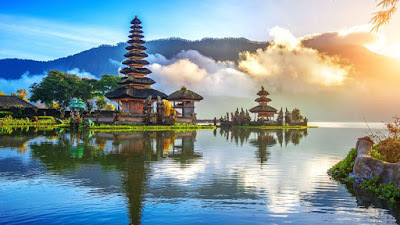 Bali not only has Kecak Dance, Barong Dance and other nuance entertainment dance that is usually packed specifically for the tourists to enjoy. Just like Japan and other countries that have dances that are only shown on special occasions, such as sacred dance for ritual or ceremony. There are some sacred dances or dances that are not shown to tourists, such as Sidakarya Topeng Dance, Rejang Dance, and so on. In this article I dedicate a Balinese dance, which you rarely see. New Inspiration has uploaded "Jauk Dance", which is usually performed in Hindu Pura or Hindu temples in Bali, and in other areas of Indonesia or the Balinese Hindu community abroad. Bali has a way to preserve their ancestral culture. Both the government and the community (Banjar) on this beautiful island hold festivals or contests regularly to preserve their art and culture. Bali has annual events like the Bali Arts Festival (Peta Kesenian Bali). Therefore visit to Bali in June to see this festival. Before you visit Bali, whether as a tourist, honeymoon couple, even if you want to seriously study the culture of Bali, then I dedicate the above video for you to make reference.